He's keen to own all big political legacies in TN. Vijaykanth may take it to fruition too. It polled 8.3% in the 2006 assembly polls. This is expected to go up. They call him Captain after a character he played in one of his films. He is also the "Karuppu MGR", not only because he is dark-complexioned but his supporters feel he embodies all that the late actor-turned-politician stood for. There is yet another moniker for him—Puratchi Kalaignar or revolutionary artist. It's a clever mix of Puratchi Thalaivi (revolutionary leader) and Kalaignar—the titles bestowed upon AIADMK chief J. Jayalalitha and DMK's M. Karunanidhi by their followers. It's a mix rife with potential. Welcome to the world of actor Vijaykanth who many see as a rising third force in Tamil Nadu politics. His Desiya Murpoku Dravida Kazhagam (National Progressive Dravida Party), or DMDK, launched in 2005, is now making both the Dravidian parties—the DMK and the AIADMK—sit up and take notice. So when he fires a salvo at Chief Minister Karunanidhi, even the Dravidian patriarch responds these days. "Karunanidhi has set up a government-owned television corporation merely to deal with a fight within his family. As the chief minister, he may see it as an achievement. But as far as I am concerned, it is only misrule," said Vijaykanth when Kalaignar TV was set up to counter Sun TV run by the CM's grand nephews, the Marans, with whom he has fallen out. Karunanidhi's response to this was: "Humility—and not arrogance—must be the hallmark of a person aspiring for higher positions in public life." Similarly, when Vijaykanth said Tamil Nadu had slid down in all growth parameters—like industrial growth and literacy—and even had 22 per cent of its people below the poverty line, Karunanidhi got state Planning Commission vice-chairman R. Naganathan to counter the DMDK leader. Last fortnight, the DMDK leader was in the news after opening his party's office in Delhi and meeting with a clutch of national leaders including NCP's Sharad Pawar and CPI(M) general secretary Prakash Karat. For the moment, Vijaykanth described himself as a regional leader whose agenda is the development of Tamil Nadu but said he was ready to align with any national party towards that end. Back home in Tamil Nadu, Jayalalitha is not happy with the rise of Vijaykanth. The impression gaining ground that the youth in the state are being drawn to his party is a matter of big concern for the AIADMK supremo. Vijaykanth's projection of himself as the "Karuppu MGR" riles the AIADMK cadre no end. This February, they tore DMDK banners which had MGR's pictures. Jayalalitha's insecurity was also apparent when she rushed to Ramavaram Gardens, MGR's home, for the first time in 20 years for his birth anniversary. Vijaykanth was ready with his taunt: "Jayalalitha's emergence as the leader of the AIADMK was an accident. MGR never declared her as his political heir. I never said I am MGR's heir. I'm just following his footsteps like Ekalavya in the Mahabharata. He took Dronacharya as his teacher, MGR is my political guru." An upper-caste Naidu from Andhra Pradesh, Vijaykanth says he and his party does not believe in either caste or religion. He enjoys a certain appeal, he claims, with the people of Tamil Nadu. "Wherever I go, I am welcomed by people from all walks of life. The ruling party has been trying to malign my reputation in every possible way because of this. Last year, they conducted income tax raids, demolished my marriage hall and deliberately levelled allegations against my engineering college," says the DMDK leader. Any assessment of Vijaykanth's political foray has to also factor in his star charisma and huge fan following. He has acted in 150 films and turned in several hits and is a known face across the state. He can draw huge crowds as was evident in his 2006 assembly election campaign. He appeals to the youth. His latest film Arasangam (Government) created a record in Tamil cinema when its audio sold one lakh copies on the day of its release in March. Add to this is his 'dark-complexioned MGR' tag which projects him as one with the Tamil masses. In 2006, he won the election—the only one in his party to secure a seat. But the DMDK was nascent then, and not organised enough. There is recognition of the DMDK's rise among politicians. Says Congress leader S.R. 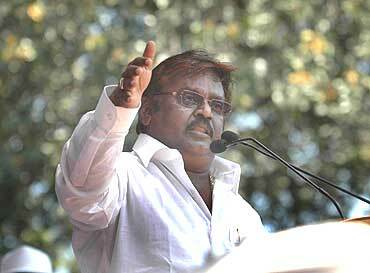 Balasubramanian: "Vijaykanth is a force to reckon with. 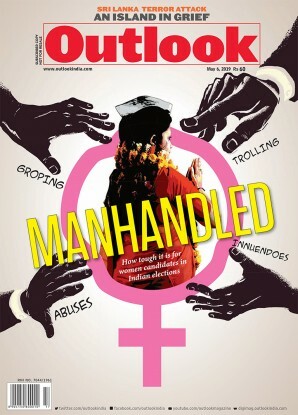 The AIADMK has launched a youth brigade and a woman's brigade to stem the exit from her camp." Adds Dr P. Radhakrishnan, professor of sociology, Madras Institute of Development Studies: "Vijaykanth will make a better politician than others (like Vaiko, Dr S. Ramadoss). He will cut into the votes of all parties and do much better in the next election." In the 2006 assembly elections, the DMDK garnered 8.3 per cent of the votes polled and contested in all 234 constituencies. This was seen as an impressive start. The DMDK hopes to cut into the political space which has been monopolised by the DMK and AIADMK since the Congress lost power in 1967. As S. Gurumurthy, the Sangh parivar ideologue of the south, puts it, "Vijaykanth has begun the process of defreezing of the anti-DMK votes. On the whole, Tamil Nadu politics is moving towards nationalist regionalism and away from separatist regionalism." Interestingly, the Captain himself was a sympathiser of the DMK. But like Vaiko, who launched his MDMK 15 years ago after walking out of the DMK, Vijaykanth realised that with Karunanidhi grooming his son M.K. Stalin, there was little chance of growth in the party. In fact, in a veiled reference to Vijaykanth, both the patriarch and Stalin have been vocal about upstarts aspiring for chief ministership. While the going looks good, the acid test will be in the Lok Sabha elections next year. If the DMDK manages to win even a few seats, it will be seen as a major shot in the arm for the party. For now, Vijaykanth joins other Tamil Nadu leaders like MGR (a Malayali), Vaiko (a Naidu) and Jayalalitha (from Mysore) who are technically outsiders. But none of them have been labelled as that. So, the DMDK leader too can pursue his political career in the state as a champion of the Tamizh cause.